After the fuel-air mixture has burned，it must be cleared from the cylinder.Therefore，the exhaust valve opens as the power stroke is finished and the piston startsback up on the exhaust stroke（Fig. 3. 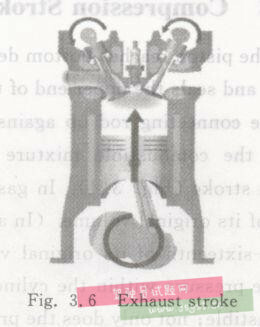 6）．The piston forces the burned gases of thecylinder past the open exhaust valve and the intake valve is closed. The burned fuelmixture is pushed out of the engine and into the exhaust system. 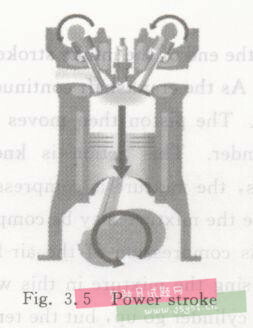 The crankshaft must rotate two complete revolutions to complete the four-strokecycle. The four strokes（intake，compression, power，and exhaust）are continuouslyrepeated as the engine runs. With the help of the heavy flywheel，this action producessmooth，rotating power output at the engine crankshaft.